For people names Larose, see Larose (surname). 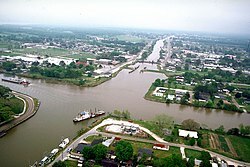 Aerial view of Larose, Louisiana at the intersection of Bayou Lafourche and the Gulf Intracoastal Waterway. View is to the east-southeast. The bayou runs off towards the Gulf at the top. The waterway crosses the picture left–right. 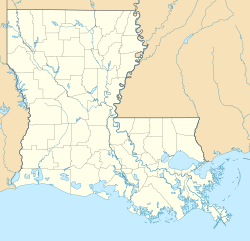 Larose is a census-designated place (CDP) in Lafourche Parish, Louisiana, United States. The population was 7,306 at the 2000 census. It is part of the Houma–Bayou Cane–Thibodaux Metropolitan Statistical Area. Larose is located at 29°34′2″N 90°22′34″W﻿ / ﻿29.56722°N 90.37611°W﻿ / 29.56722; -90.37611 (29.567328, -90.376074). According to the United States Census Bureau, the CDP has a total area of 11.5 square miles (30 km2), of which 11.2 square miles (29 km2) is land and 0.3 square miles (0.78 km2) (2.95%) is water. As of the census of 2000, there were 7,306 people, 2,479 households, and 1,990 families residing in the CDP. The population density was 651.9 people per square mile (251.6/km²). There were 2,643 housing units at an average density of 235.8 per square mile (91.0/km²). The racial makeup of the CDP was 85.57% White, 5.65% African American, 3.86% Native American, 2.38% Asian, 0.83% from other races, and 1.70% from two or more races. Hispanic or Latino of any race were 2.52% of the population. There were 2,479 households out of which 38.8% had children under the age of 18 living with them, 66.2% were married couples living together, 9.9% had a female householder with no husband present, and 19.7% were non-families. 16.2% of all households were made up of individuals and 7.3% had someone living alone who was 65 years of age or older. The average household size was 2.90 and the average family size was 3.24. In the CDP, the population was spread out with 27.2% under the age of 18, 8.9% from 18 to 24, 30.4% from 25 to 44, 21.0% from 45 to 64, and 12.5% who were 65 years of age or older. The median age was 35 years. For every 100 females, there were 96.7 males. For every 100 females age 18 and over, there were 93.7 males. The median income for a household in the CDP was $38,141, and the median income for a family was $45,126. Males had a median income of $32,020 versus $19,922 for females. The per capita income for the CDP was $15,541. About 10.2% of families and 15.5% of the population were below the poverty line, including 24.3% of those under age 18 and 13.6% of those age 65 or over. The United States Postal Service operates the Larose Post Office. Lafourche Parish Public Schools operates public schools. South Lafourche High School is in nearby Galliano CDP and serves Larose. In January 1916 the first public school in Larose, Larose Consolidated School, opened. In September 1950 the schools of Larose and Cut Off were consolidated into Larose-Cut Off High School. It was then consolidated with Golden Meadow High School to form South Lafourche High School in 1966. Lafourche Parish Library operates the Larose Library. ^ "Larose." United States Postal Service. Retrieved on March 11, 2017. "123 W 17TH ST LAROSE, LA 70373-9998"
^ Home. North Larose Elementary School. Retrieved on November 29, 2016. ^ Home. South Larose Elementary School. Retrieved on November 29, 2016. ^ Home. Larose-Cut Off Middle School. Retrieved on November 29, 2016. ^ "2010 CENSUS - CENSUS BLOCK MAP (INDEX): Larose CDP, LA." U.S. Census Bureau. Retrieved on February 7, 2018. Pages: 1, 2. ^ "SCHOOL ATTENDANCE BOUNDARIES Archived 2016-12-02 at the Wayback Machine." Lafourche Parish Public Schools. Retrieved on December 2, 2016. Based on the text description of the school boundaries. ^ "The Origin of South Lafourche." South Lafourche High School. Retrieved on November 29, 2016. ^ "Branch Locations and Contact." Lafourche Parish Library. Retrieved on November 28, 2018. This page was last edited on 31 October 2018, at 03:45 (UTC).